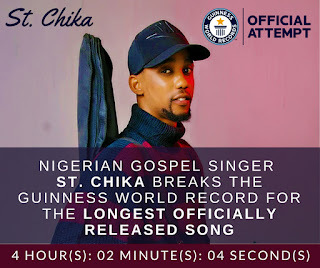 Nigerian gospel singer Chika Nwaogu popularly known as St. Chika has officially broken the Guinness World of “the longest Officially Released Song”, joining other Nigerians like Kaffy and DJ Obi. The record for the longest officially released song was previously held by PC III Label Pipe Choir from USA in 2015, but was most recently broken by Dominican Republic rapper Henry G with a 3 hrs 26 minutes, 22 seconds long song. Nigerian gospel singer St. Chika broke the record with his 4 hrs, 2 minutes, 4 seconds long song titled "Power in the Name of the Lord", breaking the previous record with over 36 minutes. The artiste said he initially hoped to record a gospel single, which would be 3hrs, 30 minutes, 50 seconds long but decided to go much longer. The song which features 64 verses was released on digital stores like iTunes, Spotify, Amazon, Deezer, Google Play, Soundcloud andYoutube. The record breaking song will also be released on blogs later in the month. The 28-year-old singer started his attempt at a recording studio in Lagos on Sunday, May 20 and finished on Thursday, May 24, 2018. The fast rising gospel singer draws his inspiration from gospel acts such as Travis Greene, Nathaniel Bassey, Eben, Joe Praize and Sinach.